Hello Denver - Bicycle Tour of Downtown Denver. Bicycle Tour of Downtown Denver. 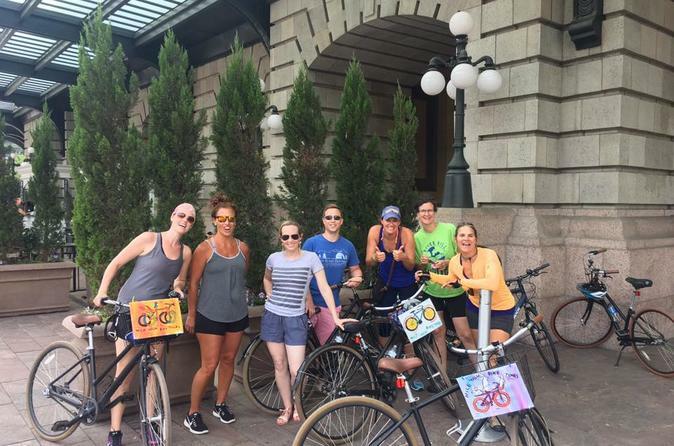 Join a knowledgeable local tour guide who will guide you on your own bicycle safely through downtown Denver's most important and relevant tourist sights including historic buildings, architectural masterpieces, professional sports stadiums, scores of public art installations, parks and outdoor venues. Groups are small, 8-12 people. Duration of tour is 2.5 hours and approximately 9 miles. This is Mile High Bike Tour's signature downtown bicycle tour. It encompasses all of Denver's best attractions and provides great sightseeing. Groups are small, usually 8-10 people. We'll ride on bike lanes, riverside paths, neighborhood streets and navigate our way around exciting downtown Denver. The distance is approximately 9 miles and the terrain is relatively flat. This tour is an excellent way to get to know what there is to see and do in Denver. The bicycles are 3 speed city cruisers with disc brakes. Currently tours depart at 11 am Monday through Friday and 1 pm on Saturdays and Sundays. © 2019 Hello Denver - All Rights Reserved.